Lay friends have always been part of the Assumption family as disciples of the Lord, friends and co-workers. They bring the density of life ‘in the world’ to the community and profit of the spiritual advantages of the religious community. They are men and women attracted to St. Marie Eugenie and the spirituality of the Assumption and to extend the Kingdom of God in their society by prayer, study, and service. 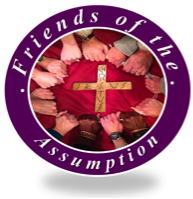 Friends of the Assumption are affiliated with communities of Assumption Sisters established in over thirty countries. Lay Communities of the Assumption are Friends who while remaining in their work and families, follow the lay Rule of Life, committing themselves more deeply and permanently. Multi-cultures and inter-generations are gifts cherished and celebrated in Assumption Family cyberspace! Be part of Online Friends of the Assumption Community! !